Now providing unlimited wifi , smart TV and a totally refurbished bathroom.This superbly located Life's A Beach Apartment offers well appointed fully self contained accommodation for up to 4 people in two bedrooms one with a queen size bed overlooking the beautiful Kingston Beach and the other with 2 single beds looking out to Mount Wellington. All bed linen, towels and electric blankets are provided. The kitchen is equipped with full cooking facilities and tea, coffee, breakfast cereal and milk are provided. The bathroom has a walk in shower as well as a new washing machine and dryer and an iron and ironing board are also provided. One free undercover off street parking space is available and allows easy access to the apartment via 2 short flights of stairs. A feature of the accommodation is the large balcony overlooking this very popular beach. 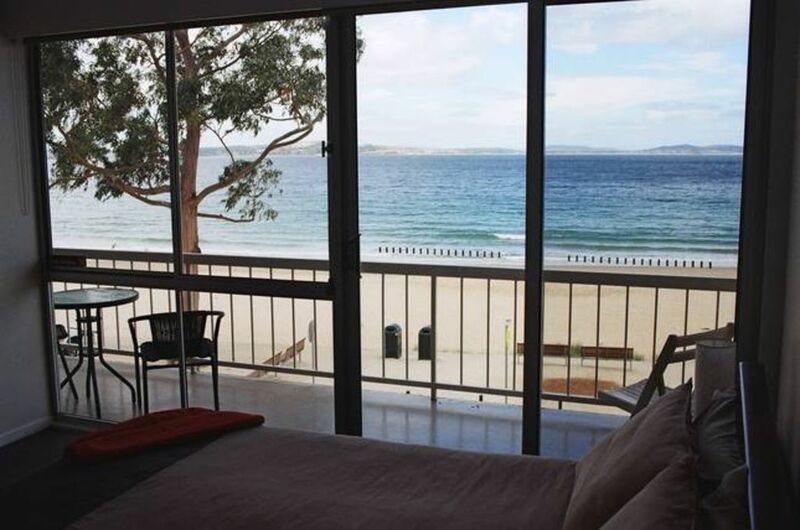 Life's A Beach Apartment is very conveniently located to Hobart only a short 15 minute drive or bus ride away. This world renowned waterfront city is Australia's second oldest and combines colonial maritime charm with a cosmopolitan state capital. With such easy access to Hobart's Salamanca markets and waterfront restaurants,staying at Life's A Beach Apartment provides an idyllic alternative to other accommodation options in the centre of the city. Whether on holiday, business or just visiting friends in the Kingston area you will find that the accommodation at Life's A Beach Apartment has much to offer. Experience the magic of beachfront living . Marvel at the ever changing moods of the water vista. Delight at the brilliant sunrises and the frequent rainbows over the beautiful Kingston Beach. You will also admire the uninterrupted views of Mount Wellington from the rear of the Apartment. Life's A Beach Apartment is also the perfect base from which to discover the wide variety of popular tourist experiences south of Hobart. From eco cruising on Bruny Island, forest encounters in the Huon Valley, wineries and restaurants in the D'Entrecasteaux Channel and local sporting facilities at the Kingston Beach Golf Club and the Kingborough Sports Centre, you will find there is something for everyone. To learn more of the above and particularly some of the great comments from our guests visit our website. The bathroom has recently been fully renovated to accommodate a large walk in shower. Best spot to stay. Loved breakfast on the balcony, fantastic view. Everything you need is here. Great meals at pub. Easy to get in to Hobart. Hope to be back one day. Amazing views, comfort and we needed nothing but a change of clothes. Everything else was here. Clean, modern, fully equipped apartment with all the luxury of home and views and sounds to please your senses. We found a gem. Thank you so very much. We loved it so much we want to move here. The view from the apartment is better than the pics online. The apartment is excellent and well fitted out. The Kingston Beach area is lovely and I wished I could have spent more time in this area, we were there for 3 nights. Downstairs there is a couple of restaurants, a wine bar (where you can purchase a bottle of wine to take away) and a fish and chip shop. Loved sitting on the balcony looking at the view and activities, (beach volley ball comps a couple of days). Close by is the Kingston shopping centre for required supplies etc. The drive back to Hobart was easy, about 15 minutes off peak. My first time in Hobart and wasn't really sure about areas. Kingston Beach is now one of my favourite places to visit. Fantastic location, wonderful hospitality by Brian. Breakfast supplies, milk in the fridge and biscuits for the kids - little extras that meant a holiday house felt like home. Very clean and neat. Modern bathroom. Kitchen had everything you needed for a self catered holiday. Going to sleep and waking up to the sound of the waves was very relaxing. Highly recommend a stay at Life's A Beach! Absolute bliss staying at this Apartment. Brian was very prompt in responding to our booking request. This accommodation is perfect! Great location, comfy beds, great bathroom, spotless and the pantry staples were really handy and top quality! We had a lovely time here and explored the beautiful region thoroughly. We will definitely be back and have no hesitation in recommending this apartment. A great place to stay! Fantastic location and a spacious, attractively furnished, sparkling clean apartment. We will definitely stay here again.